The course is perfect for both individuals (and particularly useful for landlords and DJs who have to PAT test regularly) as well as businesses looking to save money on their PAT testing bills. It’s also extremely useful for those wanting to start working as a PAT testing contractor, as certification from PASS will allow you to start work straight away. 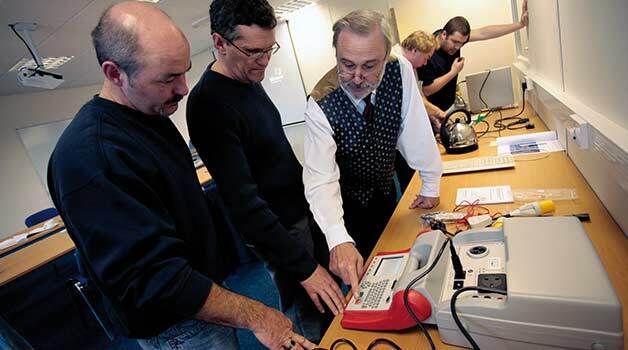 Attendees will be guided through every aspect of PAT testing in a comprehensive one day course. Divided into two sections, the morning session allows candidates to learn all about the importance of PAT testing, the theory behind it and how to appreciate electrical safety. At the end of the course attendees are then invited to complete a PAT testing exam. After a short break for lunch (supplied as part of the package) attendees will then be shown how to carry out PAT testing for themselves. We supply a number of different appliances to test along with our own PAT testing equipment, attendees are also invited to bring their own PAT testers along if they wish. This section also instructs candidates how to perform both visual and portable appliance tests in order to ensure maximum safety. Upon completion of the day and successfully passing the exam, attendees will be presented with a certificate that officially qualifies them as being competent to carry out PAT testing. The one day course is in Maidstone, Kent and runs from 9AM to approx 4PM. Maidstone (A26/Wateringbury) Chef and Brewer, 103 Tonbridge Road, Wateringbury, Nr. Maidstone, Kent, ME18 5NS. Anyone can become a PAT tester. You don’t have to have any previous electrical training to take part in the course, and it really is available to all. An interest in electrical safety would be useful, but not necessary. Candidates are not required to read any course material prior to coming on the course, but owning a copy of the IEE Code of Practice may be useful. In the Kent area? PASS are now hosting a number of PAT testing training courses in Maidstone, allowing you to learn how to carry out the work yourself and become a fully certified PAT tester!